As Dr. Jeremiah was sensitive to God’s leading in his life, he followed in his father’s footsteps. In 1963, Dr. Jeremiah received a Bachelor of Arts from Cedarville College. 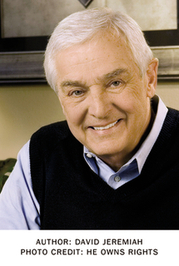 In that same year, Dr. Jeremiah married his college swe Dr. David Jeremiah, founder of Turning Point Radio and Television Ministries and senior pastor of Shadow Mountain Community Church, felt God’s calling on his life at a very early age. Born February 13, 1941 in Toledo, Ohio, Dr. Jeremiah was raised in a family deeply committed to ministry. At the age of eleven, Dr. Jeremiah and his family moved to Dayton, Ohio where his father, Dr. James T. Jeremiah, was the Pastor of Emmanuel Baptist Church, and in 1953 became the President of Cedarville College in Cedarville, Ohio. Turning Point launched a television program in 1982 in San Diego and went nationwide in 2000. Now seen around the world through cable and satellite technology, as well as on terrestrial stations all across the United States, conservative estimates suggest that close to 200 million homes around the world have access to Dr. Jeremiah's Bible teaching each week. Turning Point Television offers a half-hour Bible study message and a full hour worship service with the same great preaching. Carried on several national and international networks such as TBN, ION, and INSP, Turning Point Television has most recently been added to Middle East TV Network and BET, the Black Entertainment Network. Episode 10: "Don't Think Twice, You Only Live Once"
Production of The Account is wrapped with the final episode taped! The cast and crew were thrilled to have completed the entire series so God can begin using the message of the show, yet saddened that production has ended and moved into post-production. Our prayer is that this presentation will shed light on the moral decline of American culture.